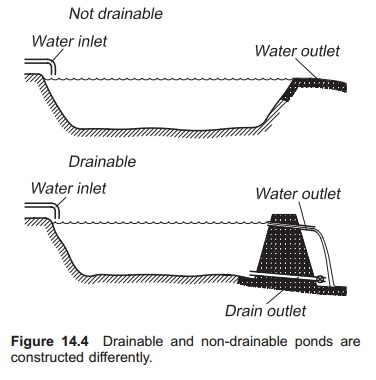 Depending on the construction of the outlet system, traditional earth ponds can be divided into drainable and non-drainable ponds (Fig. 14.4); non-drainable ponds are normally larger, up to several hectares. Small natural lakes used for aquaculture production function like a non-drainable pond. The same is the case if a ravine is dammed, watershed ponds are used or if a hole is excavated in the ground. Low establishment cost is the main advantage with non-drainable ponds. Natural lakes can also be used and create a low cost farming volume. The advantage with drainable ponds is the possibility for a more effective harvesting process and to have control over the water level, because the water can be drained out of the pond. It is simpler to fertilize/feed, and also to supply additional air. While non-drainable ponds are normally run extensively, drainable ponds can be run more intensively, depending on the amount and growth rate of the fish. In intensive drifted ponds the fish can be fed (Fig. 14.5), and additional air supplied periodically. This may also be done without damaging the ecosystem in the pond, if extra care is taken. In ponds the production is given in kg per hectare of pond surface area. This varies with water temperature, environmental conditions, pond type and the fish species, so it is difficult to give a general value. A rough estimate is 1000 kg/ha, but this can vary by a factor of 10 in both directions: over 15 000 kg/ha can be achieved for channel catfish by use of additional feeding and continuous aeration.